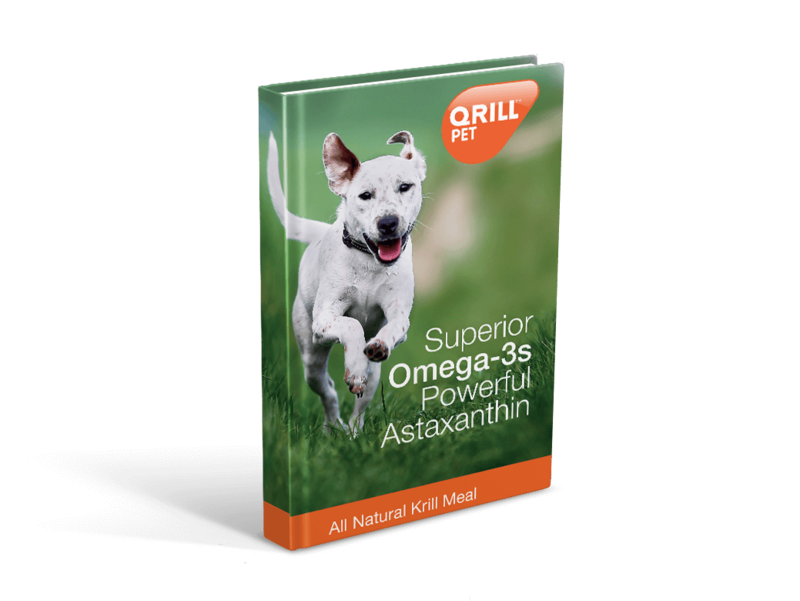 Omega-3 supplementation is vital for a pet's overall health, as their body cannot make these essential fatty acids. Therefore they need to come from a pet's diet. The National Research Council (NRC) proposes a ratio of omega-6 to omega-3 between 2.6:1-26:1. How do pets benefit from these omega-3 sources? In comparison to the other two sources, ALA (Alpha linolenic acid) is a plant source of omega-3. Pets can convert ALA into long-chain omega-3s, EPA & DHA, however the conversation rate is very small. Therefore it is an inefficient strategy to provide pets with sufficient omega-3s through ALA. Much more helpful is a direct source of EPA & DHA from marine ingredients. EPA & DHA are crucial for pet’s overall health. Omega-3 fatty acids EPA & DHA support the health of several vital organs, including the heart, kidney, liver, joints, brain, eyes, skin and coat. The right level of EPA & DHA can be achieved by the inclusion of marine sources in pet food, such as krill meal. Antarctic krill species, a shrimp-like crustacean which lives in abundance in the Southern Ocean, is rich in long chain omega-3s EPA & DHA. It is a relatively new pet food ingredient, produced with pets in mind. So, now we know that EPA & DHA from a marine source will be the most effective source of omega-3s for pets. However, not all marine omega-3s are built the same way. They can be bound together, both with triglycerides and phospholipids. Many traditional marine omega-3 source come in the form of triglyceride, while Antarctic Krill omega-3s are mainly bound to phospholipids; this is one of the main advantages for pets. Without going too much into the details, let us have a look at these two different omega-3 types. Triglycerides are the most common form of omega-3s. They are mainly found in fatty fish and have been a long term ingredient in pet food. They are made of three fatty acids (EPA & DHA) attached to a glycerol backbone. (source) When consuming triglyceride omega-3s, the pet's body has to convert them first into phospholipids before they can be taken up by the cell membranes. Triglyceride omega-3s are also more likely to be used as energy or stored as fat. For that reason a smaller amount of omega-3s bound to triglycerides will go to the membranes. Phospholipid-bound omega-3s are more efficiently incorporated into the body’s cells, tissues, and organs. This is because phospholipids are important building blocks for cell membranes. Unlike triglycerides, phospholipids are water-soluble. This distinctive benefit of phospholipid omega-3s make them gentle on the pet’s stomach and allow them to be more rapidly absorbed by the pet’s cells. In Antarctic krill, omega-3s are mostly in phospholipid form, which makes them a very effective source of omega-3s. For pets, this means that they can take full advantage of the health benefits associated with these essential omega-3 fatty acids.